I first discovered Cate Dean while reading Tales From The Mist. The Messenger was one of her short stories published within the anthology, and it was a gripping tale that stuck with me. Although I enjoyed Choices, I think I still like The Messenger better.That being said, Choices was exactly what I wanted to read. I've never much cared for stories with time travel, but this one didn't dwell on the intricacies that generally revolve around the subject, so likewise wasn't bogged down by loop holes that come with it. Instead, we jumped right into the action, following our damaged heroine, Maura, as her journey was forced upon her.I know some reviewers have said that they wished to have more detail in this story, and wished it was longer, but I think it worked okay as is. It's true, there isn't a lot of detail or back-story when you get started, but by the end, Cate has sprinkled all the answers through-out the book by our insight into Maura's thoughts, and nearly everything we original questioned has been answered.There is A LOT of action packed into this little book, and sometimes I found myself wincing at Maura's pain and rubbing my own leg. It was a very fast ride, and a worthwhile read if this is the type of book you go for. As I said before, this generally isn't the genre I'm inclined to read, and it will not linger with me as The Messenger did, but I still enjoyed it. Being forced to travel to the future Maura finds herself in strange and dangerous world filled with people who have to behave like illiterate robots to survive. She only has 3 days to return to her own time.During her short stay she will have to decide about her future.This is a well written short story filled with action, romance and difficult decisions. Fast paced, well written and unique. I did find the start a bit stuttering, as you are thrown right into action that only lulls slightly at a few places in the book. I am normally not a fan of such intense writing styles/stories, but Cate pulls it off really well. I would certainly recommend this read to friends. Story was very well written. Was a very good look at a future that could be if we as a culture aren't careful how we choose to approach things. 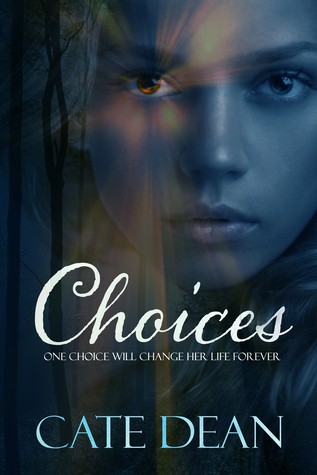 I felt the main characters pain, fear, and the difficult choices she had to make. Would definitely recommend this novella to others.